You are able to watch 3D movies on your TV at home. But have you ever wondered how it works? To see stereoscopic 3D images, the left and the right eye need to see different images. However, even without this effect it is possible to create the illusion of depth in images. With their sheer size, screens in IMAX theaters convey a sense of perspective that feels three dimensional. And because we are all so accustomed to watching television, our brains perceive the 2D images we see there as three-dimensional to some degree. You will need to buy a 3D Blu-Ray Disc player along with the 3D TV to view content. 3D-capable TVs cost twice as much as regular Full HD panels of similar sizes. 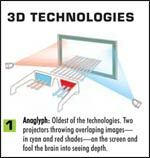 The general principle behind IMAX's 3D-like images also applies to the new 2D-to-3D conversion function on some TVs. The idea is to create a sharp contrast on screen-between a large and small object, through overlapping objects, or through differing levels of brightness or clarity-which then forces the right and left eye to analyse things differently. Another popular 2D to 3D conversion is ImageIQ3D from HDLogix using sophisticated motion analysis called optical flow. Much information about the 3D scene geometry can be gleaned from the relative motion of objects in the video and how they occlude (reveal and hide) pixels in other objects as they move-as long as the motion estimation is precise and accurate. Second, straight lines of buildings, the horizon, and other objects gives clues about the vanishing points, which also help to solve the puzzle. A generalised hough/radon transform helps identify these lines and other useful features. Finally, in most photography there is a tendency for objects that are very near and very far from the camera's focal plane to be blurred by an amount proportional to their distance from it. A Blind Point-Spread-Function Estimator is used to estimate the out-offocus character for each pixel to complete the information needed to estimate the depth of the video. Some of this information is always available, sometimes not all of it is (for example, when nothing is moving in the video). ImageIQ3D uses a superresolution-based statistical approach to achieve robust and consistent results even when there is very little or partial information available. Ultimately, the goal is to produce an accurate depth map for each video frame-a representation of the distance of each pixel in the video from the camera. Once an accurate depth map is calculated, it is possible to easily convert to and from any 2D or 3D format.